Stable. Current version is 1.0. See version history. Note: ibus-avro will not work below Ubuntu 12.04, Fedora 17 due to some dependencies. We’ll move to openSUSE 12.2 as soon as it is released with the updated dependencies and 12.1 may not remain officially supported after that. For using on other distributions, you’ll need to download the source code from github repository. Please follow the readme file for detail instructions. 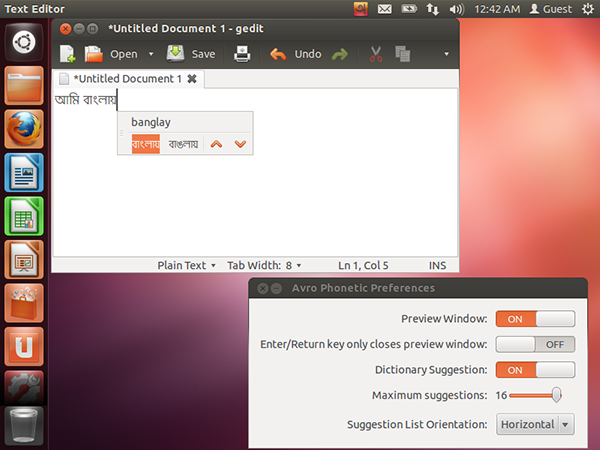 Here is the Bangla tutorial (from the Windows edition) on how to type with Avro Phonetic: Bangla typing with Avro Phonetic. ibus-avro is licensed under Mozilla Public License 1.1 (“MPL”), an open source/free software license.